This could be a silly question, but I didnt get an accurate answer in Google. So, my question is how to assign public IP address to a VM in Openstack? I need to know end to end process for the same. Let's say I have a set of public IP addresses from ISP, what all should be the next processes.? This is one scenario. Another scenario is: I want to connect to these VM's using their private IP which is our corporate network range. I have registered an IP address with MAC in our physical router, but still not able to ping/SSH the VM with that private IP. I am missing something on the networking. Can someone please help me on these 2 scenarios ASAP. I assume the most common case: You are using tenant networks. This means that instances are attached to Neutron's virtual networks. These virtual networks are then attached to a router, which connects them to a Neutron external network. This external network corresponds to a physical network or VLAN in the datacenter. Instances have IP addresses that are normally not accessible from outside. 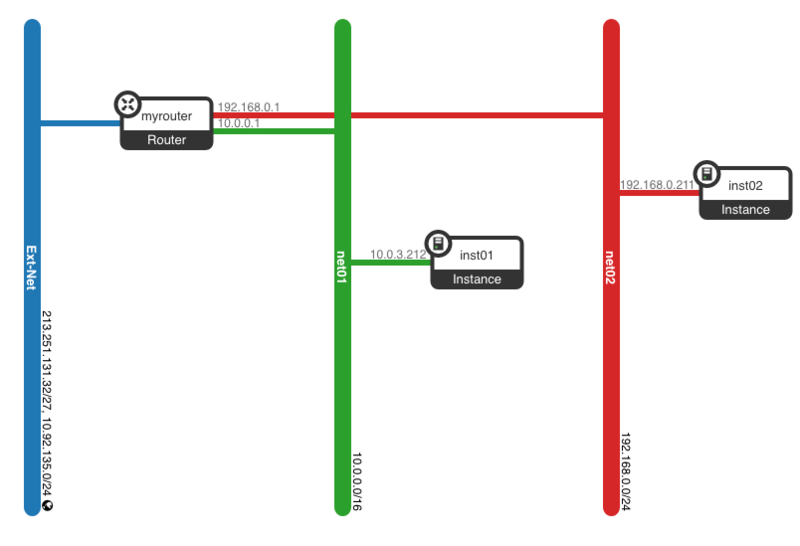 To access an instance from outside, you associate a floating IP with it. This is an address from the physical network to which the cloud is connected. The above-mentioned router performs DNAT to translate the floating IP to the instance's internal address. If the physical network is an intranet, the floating IP is obviously an intranet address. If you also want this instance to be accessible from the internet, you will have to put a mechanism in place to translate an internet address to the floating IP. This is done outside of the cloud. You can't access the instance via its internal IP because there is no route to it. Which is the usual case, as said above. In order to help you create a route, I would have to know details of your physical networking and of the Neutron networking configuration. Since I am far from being a networking expert, it is likely that you will have to talk to somebody else though. Thanks @Bernd Bausch. Do you have any networking diagram explaining this which you can point me to.? I am also not a networking expert, but has to get this done soon. You can generate one yourself. Check out the Network Topology screen in Horizon. Two tenant networks, net01 and net02, are connected to an external network, ext-net, via myrouter. One instance is connected to each network. Notice their IP addresses: They are not routable and can't be reached from outside. To reach inst01, you have to associate a floating IP from one of the ext-net subnet ranges, e.g. 213.151...., to inst01. When you send traffic to that floating IP, myrouter translates its destination address to 10.0.3.212, so that traffic reaches inst01.